Fight off flats with Mr. Tuffy Tire Liners. Should road hazards make it though your tire, these tough polyurethane barriers are your next line of defense. Mr. Tuffy Liners are lighter and less bulky than self-sealing inner tubes, plus they're easy to install and come in a variety of sizes for practically any tire. Sold in pairs. Made in the U.S.A. Put these in for winter riding and no flats so far on approx 1000km. If you don't race and would rather ride than change flats these liners are the way to go. I have them on all my bikes and I have only had 1 flat in 15 years. The flat was caused by a staple that went through the sidewall, missing the tuffy liner. I was plagued w flats on my commuter bike so I pulled the trigger on the standard wt. Tuffy's. It was easy to put on and didn't really notice additional rolling resistance (my tires are already large 700 x 42). I only have few hundred miles on these but wo them I'd had a flat by now so I'm sure these are working like it suppose to. I like them so much that I bought the lighter versions for my road bike. So if you're getting more flats than you deserve slap these on enjoy the ride. Yes, it adds weight and works, but some things get through. I do a fair amount of riding in the dark commuting to and from work in the northeast. Riding to work one early winter morning, I picked up a rather large piece of glass that gave me a flat. Don't worry, I was able to make it to work. 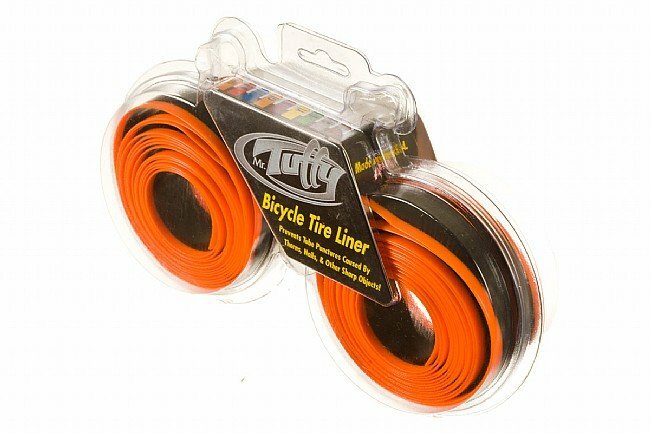 I've been using tire liners on my bikes for 25 years. In that time I've had two flats, one road the other mountain. Before that I was having flats all the time on my road bike. One of the best investments you can make as a cyclist. I prefer them greatly over tire sealer which I have also used. Install them and forget them, unlike sealer. Provides extra protection from thorns glass other sharp objects you unexpectedly run over. I commute to work six days a week weather permitting. I have three bikes with electric motor kits and do a lot of riding. Put tuffy tire liners in my tires haven't had a flat since. Had several flats before that. Good product. I ride 14 miles to work round trip daily. Plus other errand's everyday. I do a lot of trail riding before I installed the tire liners I was prone to constant flat tires due to thorns, now I get none.. Great product, try it. I use these on my road bike and I haven't had a flat yet. I was having a lot of problems with those little wires from blown racial truck tires. I use gator tires with these inside, by the way they were easy to install. I check the tires to get the wires out as often as I can and this works well for me. Remember if you don't get the wires out occasionally they will work their way thru to the tube. I've had my set of liners for three years now, and no flats. At least until I split a over-worn tire 15 miles from home. Despite the large hole in the middle of the tire, I replaced the tube and the Mr. Tuffy llner, and that got me home with just the liner between the road and the tube. Highly recommended if you hate flats. I have been using liners for many years now and very rarely get flats. The additional weight of the liners are not that noticeable and the peace of mind far outweighs the 50g per wheel. Tough liner...easy to install and on all my bikes. I use these on all of my bikes....from grocery getter to mtb.....to ease my mind ,worrying about the dreaded flat. Easy to fit and install....no having to cut to length cause they come in numerous sizes to choose from. Flexable yet strong along contact patch,no sharp edges to sand down or cut. Great product. Put this product in my gravel bike tires to keep the tiny needle shards of disintegrated truck tire steel cords on the highway (normal in Arizona heat) and the goat head thorns that are off road. So far, I haven't had a puncture since putting them in. Worth the price and the frustration in dealing with both. Easy to install, and not a problem if and when the rare flat does a occur. A fair price for an excellent product. Great for keeping the air in your tubes. I my case, they paid for themselves in about a week, not having to change a tube every dace. I am a long distance cyclist. Installed Mr. Tuffy and have ridden three 500 milers and not one flat. This is a great value. You must be a bit careful on installing the liners to make sure they are seated properly but this is not a big deal. I have this product on all my bikes and no flats!! I have worn tires down to the threads before with these in them and not had flats, nor did I even notice how thin the tires were since I usually start noticing the tires are getting worn when I start getting flats. Cuts out flats from punctures even when the tires are getting pretty worn and you usually start getting flats. I haven't gotten a flat since I installed these tire liners. I ride over broken glass almost everyday. My bike does seem a little more difficult to pedal though.